I was only six years-old in 1991. I can remember like it was yesterday begging my mom for big hair. Not just any big hair. I wanted 1991 big hair with Shirley Temple style ringlet curls. The big day finally arrived. My mom turned our living room into a full-working beauty salon. A few hours later my first perm was complete. I ran to the my parent’s bathroom to check out my new do. The excitement only lasted for so long. Perms only last so long. Within a few months my hair went back to my natural straight locks. Even after the style of the ’90s passed (although the clothing of today is starting to reflect the outfits I wore in first grade…who decided to bring back faded overalls?? ), I’ve longed for big curly hair. Maybe it’s one of those “the grass is always greener” scenarios. I want what I can’t have– gorgeous curls! Three years ago, my second child was born. Londyn was quite the surprise baby. She was delivered in less than four hours, naturally. Just for perspective, Piper was born after a thirty-six hour labor so four hours was quite the surprise! Londyn also surprised us by weighing in at 10 pounds 6 ounces. She was quite the chunk, and oh so cute. The greatest surprise of all (granted, she’s only three now, so I’m sure there are many more surprises to come) appeared around her first birthday with the sighting of a ringlet curl. Two years have now passed since her first birthday, and that one little ringlet has turned into big, gorgeous curls. While I haven’t been able to achieve the curls I so desire, I’m now living vicariously through Londyn. Wait, just kidding. There’s more. We have a DIY recipe to talk about. As Londyn’s hair grows, I’m learning curls can be very hard to care for. Curls just can’t be combed with a “regular” hair brush and tied back in a ponytail. Oh no, that’s a recipe for pure disaster, at least that’s been my experience with Londyn’s hair. Curly hair must be delicately cared for in very specific ways. A gentle comb and moisturizing detangler are essential to maintaining Londyn’s voluminous curls. Note: Yes, there was an outfit change between the first picture (above) and the next picture. 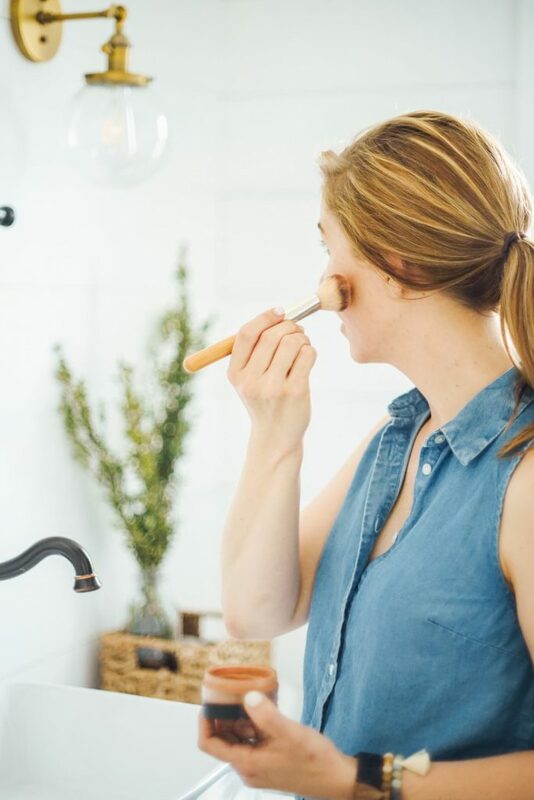 Morning routines must go on, even when Mom needs a blog photo. Glycerin: Glycerin is a sugar alcohol derived from plants or vegetable fats (there is also a synthetic version which I recommend staying away from). Glycerin is used in many beauty products due to its moisturizing properties. Glycerin is known as a “hygroscopic.” This means glycerin pulls moisture from the air. This is why glycerin makes a fantastic detangler! On its own glycerin can destroy the hair and strip it of moisture, but when diluted glycerin softens the hair and even reduces frizz. Aloe Vera Gel: Aloe vera gel comes from the aloe vera plant. The gel (found inside the leaves) is great for moisturizing the skin and hair. Aloe not only attracts moisture to the hair, but also seals it in. Aloe also contains many minerals which are beneficial for the body (including the hair and skin!). Essential Oil: This ingredient is completely optional. If you would like to add essential oils for scent, I recommend going with an oil that may provide some beneficial properties to the hair. Orange, lavender, and rosemary are great oils to add to this recipe. The ’90s: First perm. Big hair. Overalls: Please don’t bring them back, Target. Londyn: My beautiful surprise baby girl–4 hours, 10 pounds. Woah, look at that gorgeous curly hair. Leave-In Conditioner/Hair Detangler: Magic moisturizing hair juice. It’s a must! 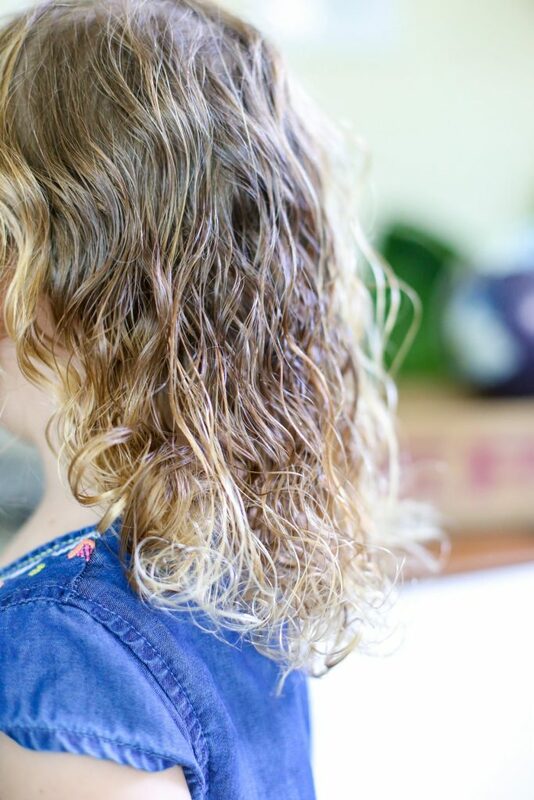 Thankfully, a homemade leave-in conditioner/moisturizing detangler recipe is very easy to make. 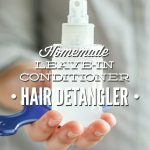 Not only is it super easy to make a homemade detangler, the ingredients work better than most store-bought products (in my opinion)! 1 TB aloe vera gel I believe you can also use pure aloe juice. 1/2-1 TB vegetable glycerin this amount depends on your hair. I recommend starting with 1/2 TB and working your way up to a higher amount. Almost 1 TB is perfect for Londyn. Some people may need more or less. In a spray bottle, combine all the ingredients. 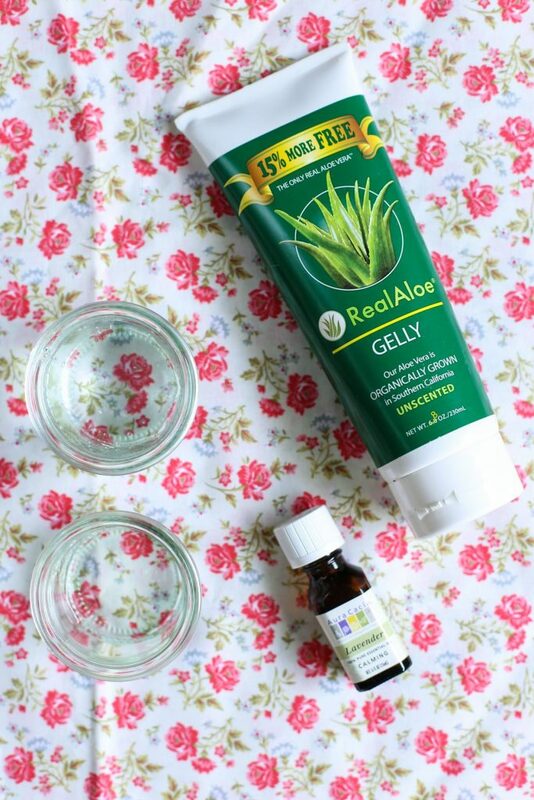 Give the bottle a gentle shake until the aloe vera is combined. That's it! 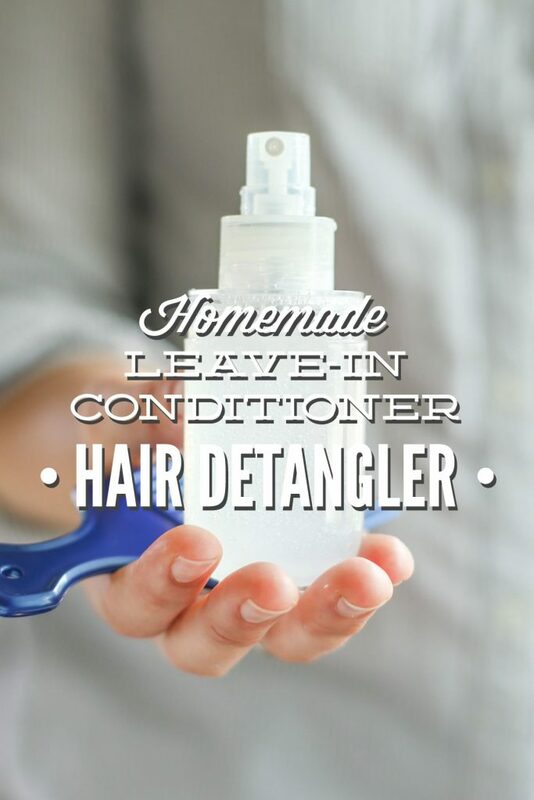 Store the detangler at room temperature. *Rosemary essential oil isn’t recommended for children under 10 years-old. Recipe Variation: If you don’t have aloe on hand, skip it! I’ve used glycerin and water many times when I don’t have aloe available. I like the moisturizing benefits and even the “hold” aloes provides curly hair, but for a simple detangler just glycerin and water also work great. Use the same recipe as above, just omit the aloe. Climate Note: Glycerin may cause the hair to swell when it’s applied in a very humid environment (remember, glycerin pulls moisture from the air). If you live in a very dry climate, glycerin may cause hair breakage. The bottom line: If you don’t live in an extreme climate, diluted glycerin is a great hair product. Kristin in your climate note were you referring to the alternative recipe of just glycerin and water or to the original recipe with Aloe vera? I live in the desert and as excited as I am about this recipe (and I really am!! )I’m worried about the climate and the glycerin now. Any thoughts? Hey Brandi, The glycerin is the main cause of concern in humid or very dry climates. Since the glycerin pulls moisture from the air, it may not have that moisture in a desert climate so it may try to pull it from the hair and cause some breakage. I’m not sure exactly what qualifies as too dry or humid for glycerin, but it’s important to keep in mind. I recommend mixing together a bottle and spraying the dentangler on a very small area of your hair for a few days, and observe how your hair reacts. 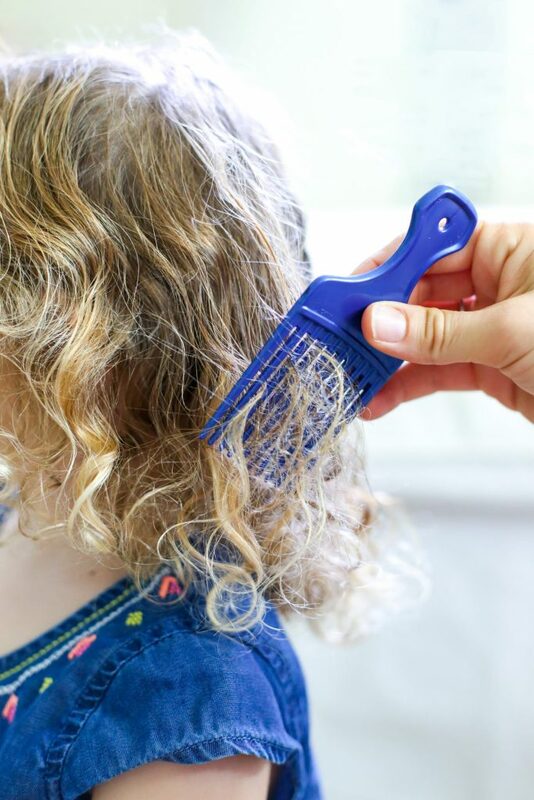 Rosemary and lavender will also repel lice, making this a great one for grade schoolers hair! They make commercial leave ins and detanglers with those scents that are marketed for just that purpose. Hi Kristen! As a curly girl myself and mother of a 4 year old and 19 month old with curls, this is awesome!! I’ve been making a similar one with coconut oil, as it really helps with frizz (with the added help of gel and mousse, haha). Just an FYI, but not shampooing daily will do wonders for curly hair. I only shampoo the kids hair on Saturday night and Wednesday. The other days I just wet their hair and co cleanse with conditioner and I always add product when their hair is wet, before bed. It helps with the tangles! Hey Leah, Great tip! Thank you so much for sharing. I’ll definitely try skipping the shampoo for a few days. I’m a curly haired girl as well! Those tangles can be a disaster. I use a coconut milk mixture now, can it be mixed with the aloe gel and glycerin? Also, what do you use to shampoo your daughters hair? I’ve switched to the “no poo” method, I like it but am always looking for new ideas. Just wondering if you have or have heard of success. Wow found your website today trying to avoid buying more carols daughter for me and my daughters hair. Breaking the bank! I am making the detangler as you say… and yes I do the no shampoo because every time I shampoo it even with the carols daughter it makes more knots than if I don’t shampoo it at all. I saw your recipe for the coffee creamer and I bow at your feet. Thank you for an awesome blog I bookmarked you. Hey Masuda, TB stands for tablespoons. I use a standard American tablespoon in my recipes. My daughters both have very curly hair. I will definitely have to try your recipe. All the others just say to use water and conditioner but I think it leaves an icky coating on their hair. Also, you should try thing brush. It’s AMAZING! Thank for sharing, Marian! I just ordered a set of brushes! Hi Kristin really thankful for sharing this beautiful tip I never posted any comments in any site but I really impressed with your tip and please kindly reply to my question. I have very dry and very very tangled hair so I used so many store bought products but store bought products have very harsh chemicals I taught of switching into homemade leave in conditioner but the only problem with the homemade products are they are not handy to travel and they should always store in a refrigerator. Hey Angel, Yes, the spray may be stored at room temperature. The spray will last 1-2 months at room temperature. Due to the water in the recipe I wouldn’t go any longer than a couple of months. While I think this spray works best on wet hair, I’ve used it on my daughter’s dry hair. If the spray is stored in a travel-size bottle, I think it would be very handy to travel with. Thank you very much Kristin.For sure I will try this spray but a quick question can I extract aloe gel from the fresh alovera plant or shall I buy the aloe gel from the store? If I use fresh aloe gel from the plant then does the spray last for 2 months? Or shall I store in refigerator If I use fresh aloe gel from plant? Hey Angel, If you can find a “cleaner” aloe vera gel (I like Real Aloe brand), then I recommend using the bottled gel. If you can’t find this, then fresh aloe should work, but the detangler will have a very short lifespan (just a few days or a week). Hi kristen i love your recipe for both my daughter and for my curly hair. I do wish to let you know however that rosemary e.o. is not recommended for children under the age of 10. I stumbled across this when i was researching eucalyptus for congestion in toddlers. I would just air on the side of caution and either substitute or leave out entirely. I’m going to keep using it on my hair because i love it, but mix her up a new batch with maby some rosewood oil. Hey Kathryn, Thank you for sharing! Yes, you’re correct about the recommendation due to chemical constituents called cineol and menthol, and the issues that can arise. It’s always best to research before adding any oils to a product–I’m glad you’re doing this! PS: I’ll make sure to make a note next to the rosemary recommendation :). Thank you so much for this! My daughter has really fine, curly hair. Every morning it is such a pain to comb her hair. This worked so well and it leaves her hair so soft! Thank you for sharing all your great ideas! I love all your recipes however, recently after doing some research, I am some concerns around shelf life. How long can this product last considering it has both aloe and water in it which can attract bacteria fairly quickly? There are a lot of natural product recipes that use distilled water and aloe and I have recently learnt without a preservative these can’t be used for long. As your very knowledgable it would be great if you could consider writing an article on the shelf life and safety or bacteria in natural products? I’m so glad you’re enjoying the blog! 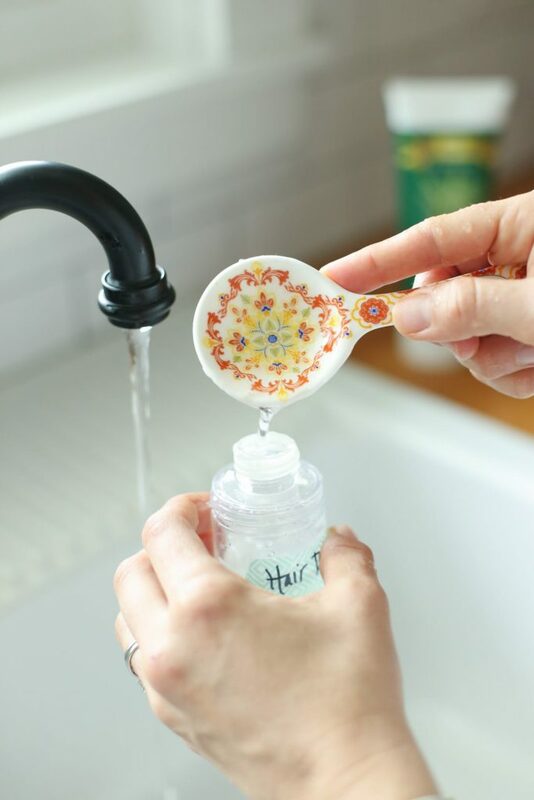 Yes, the shelf-life of a product is greatly reduced when water is used. If fresh aloe is used, the shelf life is even shorter. For these products, I keep my recipe ratios very small, so the product is used within a few weeks, and it is usually best to keep products with fragile ingredients (like a milk or aloe juice that requires refrigeration) in the fridge. I haven’t found a preservative that I feel comfortable using, or one that’s readily available and effective in low quantities (like tea tree or rosemary essential oil). 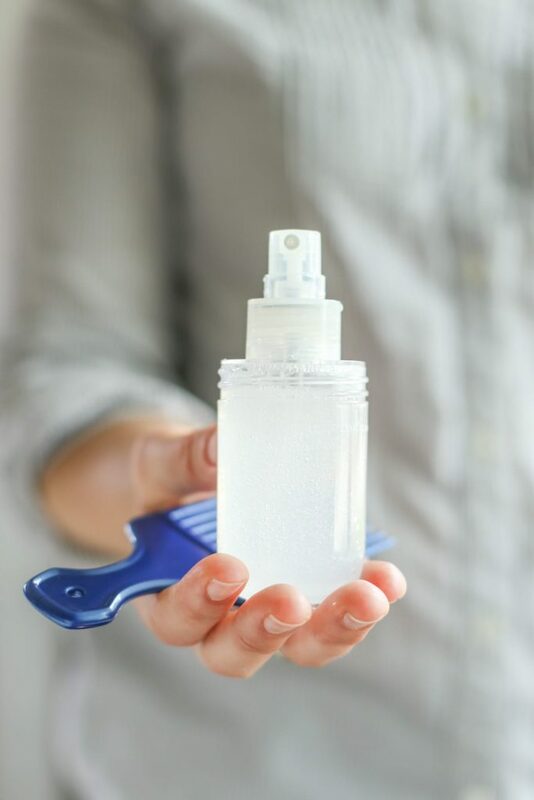 If you have the DIY Natural Cleaning Challenge, there are a couple of pages before the recipes that talk about safety, bacteria concerns, etc. I’ll work on getting this information on the blog, too. I would be happy to send you that information via your email later this week. My 5 yr old daughter and I both have curls and the resulting difficulty with tangles. The best thing I have found so far is going no poo. Every product I bought for our hair did not work well. Once a week, I wash my hair with a flax seed “tea” and then I scrunch in a lot of aloe gel (a liquid-y type that has to be refrigerated). Over the course of the day, the aloe soaks in while also keeping my frizz calmed and my curls defined. At night, I brush each section of my hair with a boar bristle brush to distribute the sebum to the ends of my hair. I follow the same routine with my daughter’s hair, but I wash her hair with the flax twice a week, since she’s a kid and gets dirty sometimes (at the park, etc.). She loves when I brush her hair with the BBB (boar bristle brush). And I always use a comb when I put the aloe gel in her hair after her wash. I intend to exchange the pure aloe for your recipe and try that. Thank you for your work and your dedication to helping people find ways to live their own way. Hugs to you. Thank you so much for posting this. My hair tends to be quite dry, and I have tried many hair oils over the years. The only thing that really seems to nourish my hair is olive oil, so I was looking for a leave-in conditioner for in between hot olive oil treatments. This recipe has been awesome for my hair! Leaves it silky and soft. Thank you! Hey CNik, I’m so glad this recipe has been helpful for you!! Is it possible to use tap or filtered water instead of distilled? Or possibly just boiled tap water? Hey Kali, Yes, but you’ll want to use the detangler within a few days. You could also boil filtered water–you’ll want to boil it for about 15 minutes. Hi i came from googling for a diy leave in conditioner, this seems like a nice hair recipe but it would have brought the post together if you had a picture of your daughter’s hair after it had dried. I appreciated the before shot but there’s nothing to compare it to, just some wet hair. Anyway, awesome blog otherwise, I am enjoying reading your recipes! Thanks for the tip, Olive! 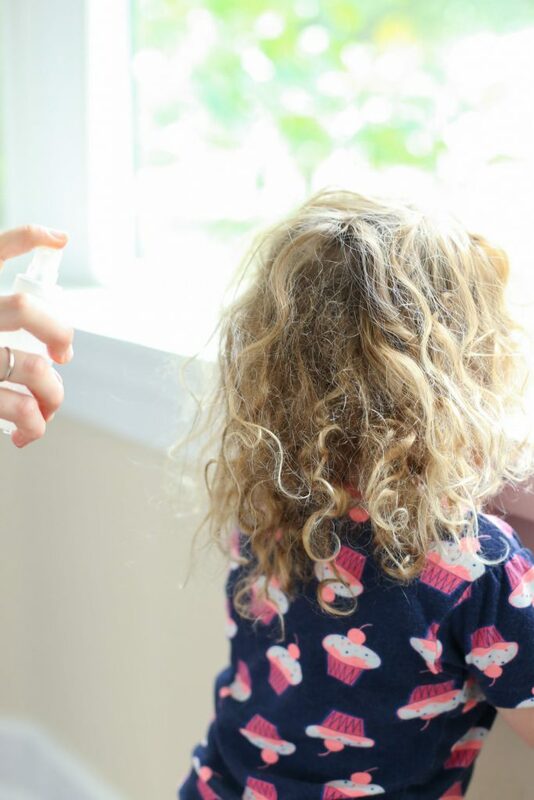 My goal was to show that the product works as a detangler–to help relieve the pain that comes with brushing curly, tangled hair and make brushing the hair easier. I’m so glad you’re enjoying the recipes. Thanks for the recipe(s)! I LOVE your blog & have been working my way through the products in our house replacing what I can with DIY stuff & your blog has been an excellent resource! Quick question! 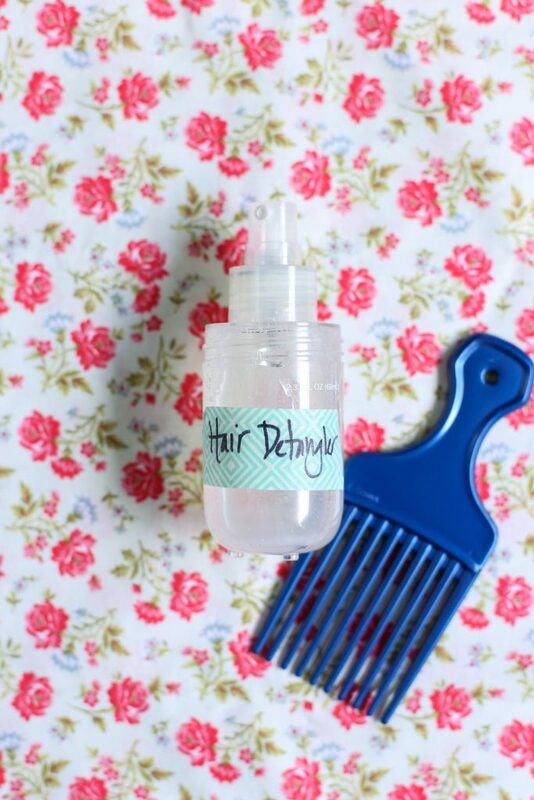 I just whipped up a batch of this detangler for my kiddo & it seems to leave a sticky residue on my hands/her hair. I am applying it to mostly dry hair on days she doesn’t wash her hair (it’s pretty easy to come when freshly shampoo’d & wet) so maybe that’s why, but I just was curious if you had this issue? I did start with 1TB of glycerin, but then ended up adding extra water a day or 2 later to try to dilute the glycerin & see if that helped. No luck. Thoughts?
? Is 5 T. distilled water correct? that barely makes any. 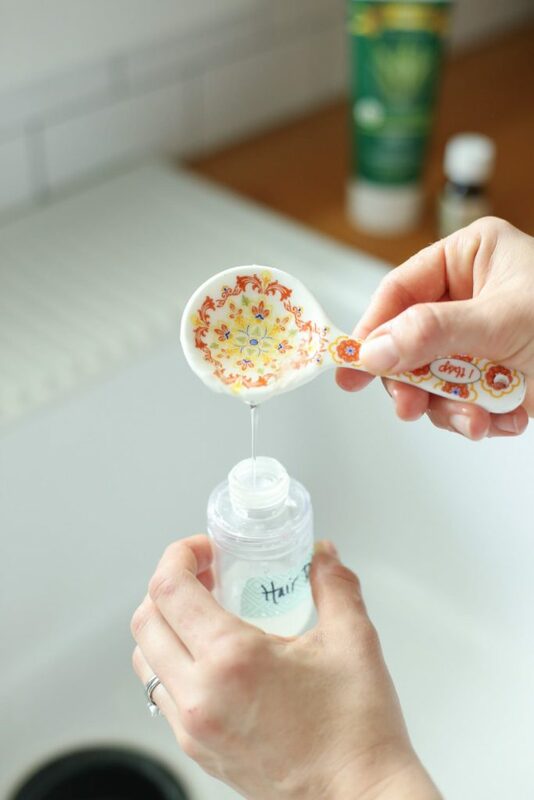 Hey Barb, Correct, this makes a small amount at a time–the best way to make homemade body-care products using water :). Hey Vickey, It sounds like you want to use this recipe with a change to the essential oil? That’s fine :). You are a life saver!!! I lost all of my straight, limp hair to 11 months of chemo and was blessed (?? if you could call curly hair a blessing) with a head of curly hair to replace it! I am LOST! I wake each days hours early just to cry as I attempt to comb matted frizz and style it. I plan to make your recipe tomorrow!!!! THANK YOU! 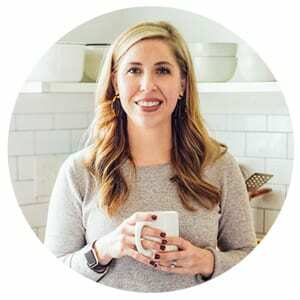 I just love your blog and recipes. Literally my go-to. This recipe is just what I was looking for after using a store bought detangler on my daughters last night and realizing it had wheat in it (makes me very sick). I have ingredients purchased and ready to overhaul my whole skincare routine too. Thanks for all you do! Thank you so much, Stephanie! I’m so glad you’re enjoying the recipes and finding them helpful. Hey Stacey, I would try a bit of argan oil–just a pea-size amount is all you’ll need. I can’t wait to try this! The little spray bottle is so cute. Where can I find these? Hey Brenda, Most health food stores will sell them in the aromatherapy section, or Amazon. My question may seem to be a little off topic, but is relevant to the ingredients and their effect you were sharing for the hair spray. You mentioned and gave a rationale for a cautious use of glycerin on hair depending on the climate. Do you know if glycerin has the same effect if used on skin (facial products)? I live in Nevada. Hey Olga, Glycerin can be moisturizing for the skin when used in moisturizers. Not sure if this has been asked but is there a substitute for the aloe? Here are some substitutes but they can cause your hair to be oily if you use too much. Wow found your website today. I am making the detangler as you say. Thank you for an awesome blog I bookmarked you. Thank you, Junaid. Glad you’re enjoying the detangler.